“Before” and “Current” Photo OVERLAY! | Keep It Up, David! 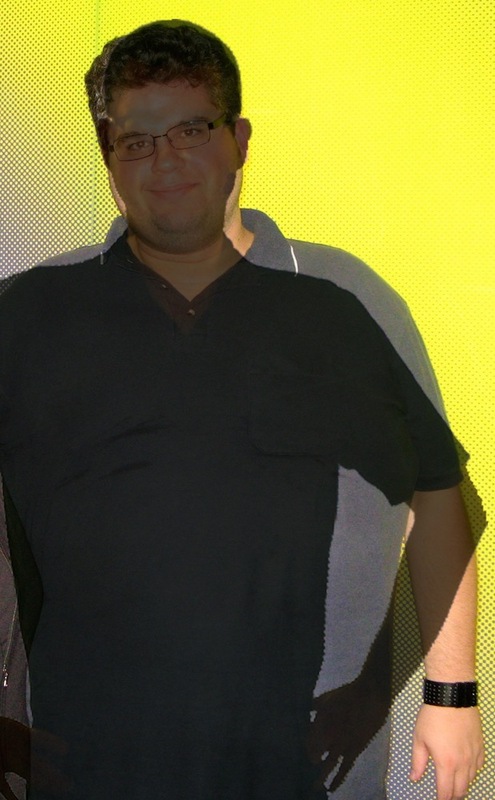 “Before” and “Current” Photo OVERLAY! I absolutely LOVE it – it’s so unbelievably cool! No need for “Before” AND “Current” pictures… Steve combined them into one! This is going immediately into the Photo Gallery. Thanks, Steve! Did you have a good weekend? Mine was quite nice, except for the jarring realization on Saturday that my 163-story stair climb fundraiser challenge is only one week away. If you’re struck with a sense of deja vu, it’s because I already wrote a post about the stair climb being one week away, but that was before I injured my foot and postponed the climb for two weeks. Now my foot feels a whole lot better – I’ve been gradually putting more pressure and weight on it during my workouts over the past few days, and there’s been no flare-ups or pain whatsoever. On Saturday, when the one-week-away realization hit me like a truck, I decided to ramp my StairMaster training back into high gear. After all, thanks to the injury, I’ve only been on the StairMaster once in the past two weeks. I ended up spending 21 minutes on the StairMaster, and climbed 84 stories, burning 318 calories. Not bad at all. It’s only half of the 163 stories I’ll be climbing this Saturday, but I hope to get one or two more training sessions in before the big day. I’ll be ready. And I get to add a new tower to my Skyscraper Collection! I plan on taking a little (or big) break from the StairMaster after my challenge, so I thought I’d add another landmark to my collection while I still could. It’s 77 stories tall, and I’ve wanted to add this guy to my collection for a while now. My favorite thing about the Chrysler Building was how Walter Chrysler and architect Willam Van Alen, during the building’s construction in 1929, kept the now-famous 7-story, 185-foot spire a complete secret. No one in the press knew it existed, and it was constructed within the lower part of the building, so no one could see it taking shape. Then one day, to everyone’s surprise, it was hoisted and bolted into place in just 90 minutes. Just like that, the Chrysler Building became the tallest building in the world, edging out 40 Wall Street, another building under construction at the same time. The Chrysler Building only had the world-tallest-building title for 11 short months, though… then the Empire State Building came along. 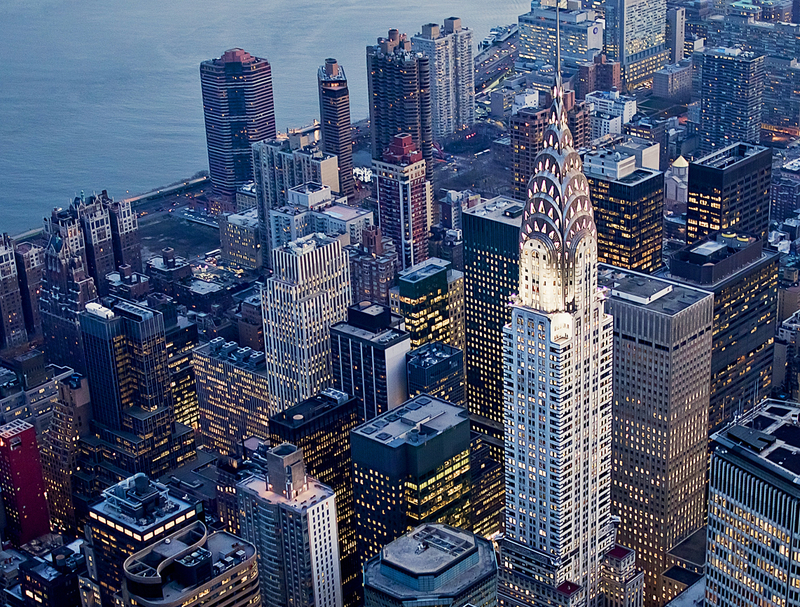 And here’s something I just learned while researching this post: The Chrysler Building has never been owned by the Chrysler Corporation, nor did the Chrysler Corporation pay for its construction, even though their headquarters were there from 1930 through the ’50s. Walter Chrysler paid for it himself, so that it could be passed down to his children. FUNDRAISING UPDATE: I’m almost there! I’ve raised $1,555 dollars, which means I’m 95% of the way towards my $1,630 goal. Only $75 short! Can you help me with those final few bucks? Click here to read about the stair climb, and CLICK HERE TO MAKE A DONATION. Thanks! Finally… I went to the pool yesterday for my second swim in a week (read about the other swim here). My friend Emily came along, and the pool was very crowded and it was hot. 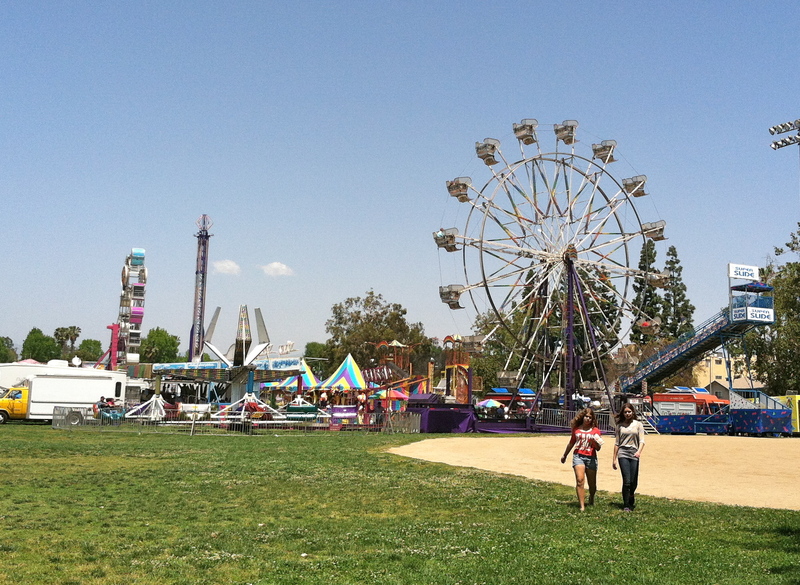 I got in 2,100 yards before calling it a day, and then Emily and I walked across the park to a… carnival! I took the exact same picture at Disney California Adventure with Mickey’s Fun Wheel (see it here). I guess it’s my thing with Ferris Wheels. 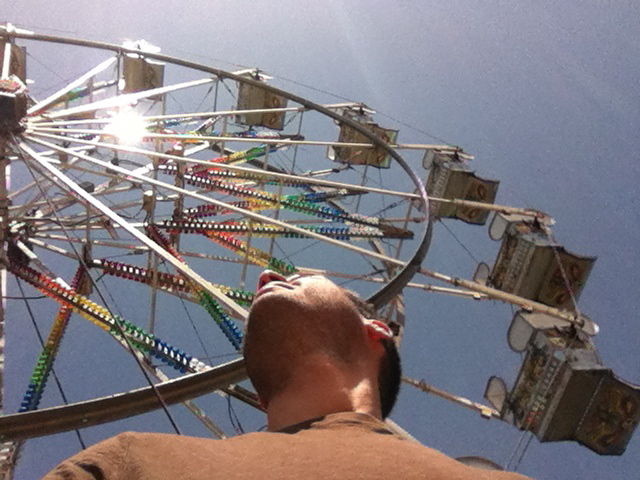 Yep, me and Ferris Wheels have a thing. Jealous? Even though Emily and I didn’t ride any rides, we did buy a snack (er… Emily bought us a snack, to be specific). There were a lot of options: Funnel Cakes. Cotton Candy. Nachos. Corn Dogs. So what did we decide on? Roasted Corn on a Stick! 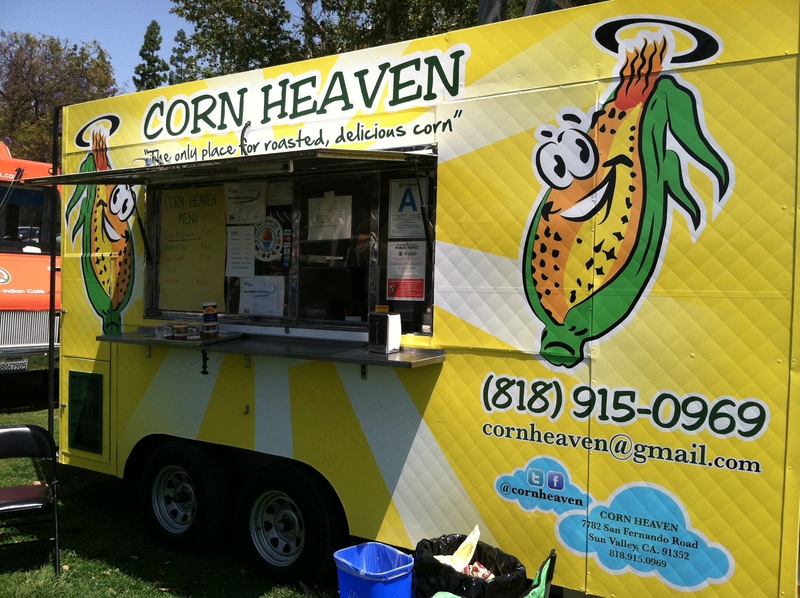 There was a row of Food Trucks, and this came from the Corn Heaven truck. I got mine with lemon juice, and added some Cajun seasoning. Might have been the best corn I’ve ever had! I definitely wanted to go back and buy 4 more ears, although that’s where the lack of funds became an issue. Eating veggies at a carnival? This entry was posted on Monday, April 30th, 2012 at 12:01 am and is filed under Uncategorized. You can follow any responses to this entry through the RSS 2.0 feed. You can leave a response, or trackback from your own site. 8 Responses to “Before” and “Current” Photo OVERLAY! 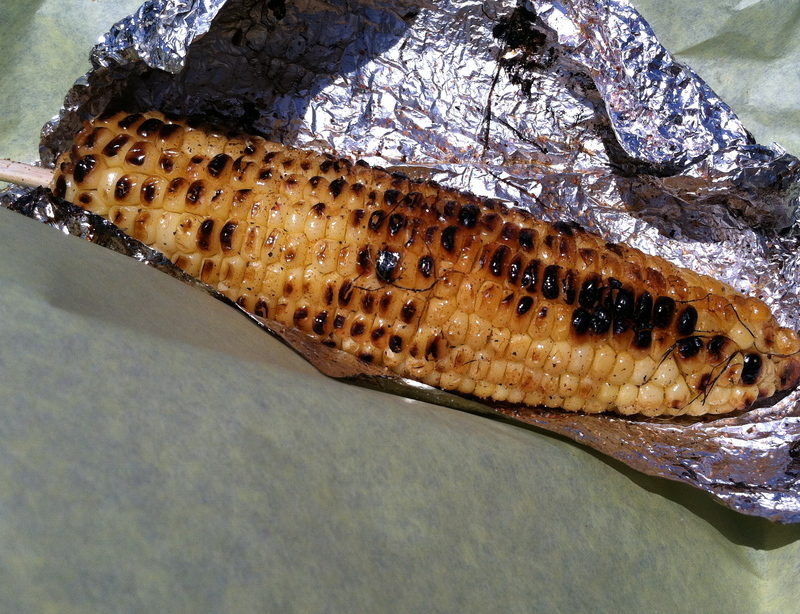 I used to go to the LA County Fair for the roasted corn. I was a fan of the spice bar that the corn vendors would set up on a nearby picnic table. I miss it! That overlay picture is CRAZY awesome! I hope you’re going to have it framed on canvas or something. Congrats on your climb too! I think it would look dynamite printed directly on canvas and stretched over a wooden frame- like how the Target type wall art is done. but better because it’s not mass produced. Or I could make 10,000 of them and sell them to Target! Hi! CLICK HERE to see all my recipes!